We’d love your help. Let us know what’s wrong with this preview of To Market, To Market by Anne Miranda. To ask other readers questions about To Market, To Market, please sign up. The order of the animals? My favorite part is when the lamb ends up in the dishwasher. 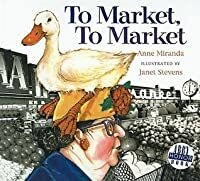 “To Market, To Market,” is a brilliantly illustrated book that captures children’s attention immediately. The sing-song, rhyming pattern makes this story enjoyable to read and entertaining to listen to. The story is about an old lady going to the market to buy different animals. As a reader, we are not exactly sure what she is going to do with all of these animals. It is inferred that she may possibly eat them, but the poor old lady can’t keep all of these animals under control under her roof. Then the old lady goes back to the market with all of the animals by her side and she shops for a whole mess of vegetables and decides to make hot soup for lunch. Goofy book told in rhyme for preschool/KDG crowd about a little old lady who goes to the market to buy a bunch of farm animals. The illustrations are crazy good....so much to look at that you can read it over and over and find something new on each page every time. Who knew farm animals could have so much fun being naughty. This is a fun, silly book. It's slightly over some preschoolers heads, though. Still, most of them seem to get it and enjoy it. Decided I had to upgrade this one. It's grown on me, since we read it about 103 times a day. And it promotes a vegetarian lifestyle, which is always a good thing. This was the favorite of the books I read to Alena this morning. It made me laugh out loud. I particularly like the illustrations. I will definitely look for more books by the illustrator. To Market, To Market is a funny parody of a traditional nursery rhyme. The book begins with the words of the traditional rhyme, but the illustrations immediately give the reader a clue about the wacky nature of the book. The first page shows an old woman dressed in many bright colors pushing a grocery cart that really can’t contain the fat, pink pig that she plans to purchase. After the first page, the words deviate from the traditional rhyme. The old lady returns to the market repeatedly, each To Market, To Market is a funny parody of a traditional nursery rhyme. The book begins with the words of the traditional rhyme, but the illustrations immediately give the reader a clue about the wacky nature of the book. The first page shows an old woman dressed in many bright colors pushing a grocery cart that really can’t contain the fat, pink pig that she plans to purchase. After the first page, the words deviate from the traditional rhyme. The old lady returns to the market repeatedly, each time picking up one live animal and returning to increasing chaos in her kitchen. Anne Miranda’s simple, rhyming text depends heavily on Janet Stevens’ clever illustrations. The illustrations are a mix of painting, drawing, and collage, and they help tell the story of the poor old woman’s shopping struggles very effectively. Stevens uses black and white photos of a market and of a kitchen to create collage backgrounds throughout the book. The brightly colored old woman and animals stand out against the background, highlighting their importance in the story. Each time the old woman returns to the market to fetch a new animal, that animal stares directly at the reader from the bottom left corner of the page, as if inviting the reader to join in the upcoming mischief. In the end, the woman devises a scheme to try to tame the chaos. It seems like a good solution, but the wordless last page shows the old woman and all of the animals sleeping in a heap on the floor of the rather messy kitchen. This leaves the reader wondering what will happen next. Summary: The woman keeps going back to the market to get more and more animals. Each time she brings them home, they create chaos all over the house. The animals bring the woman back to the store and together they get ingredients for them to eat lunch together. Review: I like how this rhyme can be read in the tune of the original Mother Goose rhyme to make the flow consistent of the read. I didn't really understand the theme of the story, or the point of it; I know it is a "twist" on the original rhyme, but I think there could have been more of an explanation. The illustrations were very colorful, which I did like. Uses in class: 1. The class can have a "market day" and one student can be the cashier and the other can be customers coming to buy what they need; it can become a dramatic play area. This book is one of my and my son's (3 years) favorite books. I was astonished to see that it is not on the list. The author is from Boulder, CO which is local for us and we grabbed it from the library. We have probably read it 50 times and checked it out from the library 2 times. The illustrations are hilarious and make both of use laugh out loud every time! That coupled with the fun rhymes make this an absolutely enjoyable book. The story and pictures inspire imagination and expose a hilarious This book is one of my and my son's (3 years) favorite books. I was astonished to see that it is not on the list. The author is from Boulder, CO which is local for us and we grabbed it from the library. We have probably read it 50 times and checked it out from the library 2 times. The rhyme has further verses involving other animals that we infer are to be eaten, or produce something we may eat. Miranda takes it to a whole new (and vegetarian) level, but you don't have to be a vegetarian to find this book hysterically funny. There is not much text on each page, and so it is suited to toddlers, but it could also be used beneath a document camera in the classroom to teach theme or author's purpose. This review has been hidden because it contains spoilers. To view it, click here. 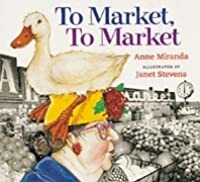 To Market, To Market by Anne Miranda is about an old lady who goes to a market and comes back with a fat pig, a goat, a fish, a goose, and many more animals that trash her house and makes her life chaotic. I read this book to a group of kids at the daycare and I honestly couldn't tell if they liked it or not because of it's strange storyline. They were probably thinking "this can't be true! An old lady who brings all different types of animals in her house! Unheard of!" 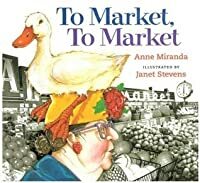 It was a silly book but I To Market, To Market by Anne Miranda is about an old lady who goes to a market and comes back with a fat pig, a goat, a fish, a goose, and many more animals that trash her house and makes her life chaotic. I read this book to a group of kids at the daycare and I honestly couldn't tell if they liked it or not because of it's strange storyline. They were probably thinking "this can't be true! An old lady who brings all different types of animals in her house! Unheard of!" It was a silly book but I think they might of liked it because of it's humor along with it's rhyming pattern. The illustrations were also very detailed and colors were bright. It made the illustrations pop. I could see this book being used for learning about produce and agriculture due to the fact that the lady was visiting a market. You could show kids what happens at markets and what is sold there. A fun and hilarious way to teach children about cooking, healthy eating and rhyming words. The illustrations are amazing and very funny. The book is fun to read repeatedly in the class and to always have for children to look at in the library area. Once the book is read and benefits of home cooked meals with fresh produce have been discussed conduct a cooking session in the classroom with children. (Keep in mind allergies). The class could make soup as a group or make pancakes. Involve A fun and hilarious way to teach children about cooking, healthy eating and rhyming words. The illustrations are amazing and very funny. The book is fun to read repeatedly in the class and to always have for children to look at in the library area. The old "to market, to market" nursery rhyme gets a delightful and animal-friendly update. An older woman visits her local market and brings home a succession of farm animals--ranging from a goose to a cow. After the mischievous critters wreck havoc on her home, the woman returns to the market--to buy all of the ingredients for a hearty vegetable soup to prepare for herself and her new friends! The old nursery rhyme upon which this is based is, of course, a story about buying live animals at an o The old "to market, to market" nursery rhyme gets a delightful and animal-friendly update. This is a hilarious tale of a lady busy shopping. She ends up buying live farm animals which create a chaotic mess in her house. She finally decides to buy veggies instead. She then makes soup for all the animals. Lots of rhymning make this silly tale lots of fun for children. teaching application- Making soup with the kids would be fun. Writing and reading a recipe, kids could go shopping for supplies,or adding an ethnic flare by using ingredients from other cultures would all be fun. The childr This is a hilarious tale of a lady busy shopping. She ends up buying live farm animals which create a chaotic mess in her house. She finally decides to buy veggies instead. She then makes soup for all the animals. Lots of rhymning make this silly tale lots of fun for children. 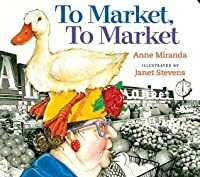 Anne Miranda's inventive twist on a classic rhyme tells what happens after a shopper goes "to market, to market, to buy a fat pig." Back home the pig promptly escapes, and soon the pig's in the kitchen, the lamb's on the bed, the cow's on the couch--and the rest of the animals are wreaking havoc throughout the house. This was a funny book. I would use this book as more of an entertainment piece. I would probably have it as part of my library collection for students to read whenever they would lik Anne Miranda's inventive twist on a classic rhyme tells what happens after a shopper goes "to market, to market, to buy a fat pig." Back home the pig promptly escapes, and soon the pig's in the kitchen, the lamb's on the bed, the cow's on the couch--and the rest of the animals are wreaking havoc throughout the house. This book is about a lady who goes to the store to buy some animals and goes home but every time she comes home, it’s a bigger and bigger disaster. She eventually takes them all to the grocery store with her and when they all go to the grocery store, they get all the food they need to make soup and they finally get to have a yummy lunch in a messy, messy house. I would use this book for entertainment and to show the students that when you work as a team, you accomplish more together than alone. A silly variation on the traditional nursery rhyme. Loved the illustrations! And all the things the animals get into! Would be a good addition to storytimes on cooking or food, or on any number of farm animals. Lots of potential for over-the-top frustration from the lady narrating the poem. In a group storytime, everyone might not see all the details in the illustrations, but they'll still get the gist of what shenanigans the animals are getting up to. In a one-on-one read, that'll be added fun. I loved Mother Goose tales and nursery rhymes when I was a kid and that love has never waned. This is a retelling of To Market To Market (To Buy A Fat Pig), but it is nothing like the original (in a good way). The illustrations are FABULOUS! Black and white backgrounds with colored characters added in...it was a joy to simply look through this book. The retelling is humorous. The book doesn't end the way you might expect, so if you like surprises, nursery rhymes, and good artwork, this book will I loved Mother Goose tales and nursery rhymes when I was a kid and that love has never waned. This is a retelling of To Market To Market (To Buy A Fat Pig), but it is nothing like the original (in a good way). The retelling is humorous. The book doesn't end the way you might expect, so if you like surprises, nursery rhymes, and good artwork, this book will definitely satisfy you. This is s fun and hysterically hilarious book that helps to teach children about cooking, healthy eating and rhyming words. The illustrations are amazing and very funny. The book is fun to read repeatedly in the class and to always have for children to look at in the library area. All the animals are live and they make mischief once home. I like how this book is related to the real life! This book is about a lady going shopping; the food she happens to buy are live animals. She tries to cook them, but it does not work out so she goes back to the market. This book is a fun and exciting way to show children the joys of cooking and how to cook. The fun part about the book and cooking is that the animals are alive and usually when you cook animals they are already dead. This book would be great for kindergarteners and helping them with their rhyming words. The illustrations in this book are really cool. The illustrator juxtaposed colorful drawings of the characters with black-and-white photo collages of the grocery store and kitchen, which makes for a neat effect. There is a ton to look at and talk about in these pages. I love the illustrations of the animals, especially of the pig. The story of animals running amuck is entertaining, too. I'll have to remember to check this one out again when my son is a bit older and can really appreciate it. The familiar rhyme is set to new illustrations as visits to the market result in pandemonium at home. The rhyme was fun and interesting in this, and had a few twists on the familiar, but there was something off-putting about the illustration style. I liked the increasing busyness, but there was a lack of appeal in some of the designs. It was still fun to read. This review has been hidden because it contains spoilers. To view it, click here. Funny book about a lady who just wants to eat! She brings home a bunch of animals but keeps misplacing them and then she finally just gets veggies and cooks those and feeds all the animals in her home. Then they all knock out. Used this one for a "Food" themed storytime on 11/20/18. The kids loved it. I have no idea why this woman brought so many animals home but I hope she had a big glass of wine waiting for her at the end of this book. Favorite illustration: the lamb standing in the dishwasher. This book puts a spin on the original nursery rhyme, and does an amazing job at it. I enjoyed it. The illustrations were captivating and the story line was interesting. Excellent read. Another book that my children adored when they were quite small-- I would guess that they were somewhere between 2-5 when this one made them crack up. Led along by a fun, funny rhythm--an easy, seductive poetry. The illustrations alone make this a laugh-out-loud must! I am a freelance writer of books and educational materials for very young children. I'm represented by Ron Zollshan at Kirchoff/Wohlberg in Ct. I have been published by: Addison-Wesley, Boyds Mill Press, Bradbury Press, Bricks (Korea) BridgeWater Books, Bt Bound, EP Dutton, Harcourt Brace & Company, Hampton-Brown, Heinemann (Fauntas & Pinnell) Holt, Houghton Mifflin, Hyperion, Joy Street Bo I am a freelance writer of books and educational materials for very young children. I'm represented by Ron Zollshan at Kirchoff/Wohlberg in Ct. I have been published by: Addison-Wesley, Boyds Mill Press, Bradbury Press, Bricks (Korea) BridgeWater Books, Bt Bound, EP Dutton, Harcourt Brace & Company, Hampton-Brown, Heinemann (Fauntas & Pinnell) Holt, Houghton Mifflin, Hyperion, Joy Street Books, Laidlaw, Little Brown, LB Kids, Macmillan McGraw-Hill, McGraw Hill School Division, Modern Curriculum Press, Newbridge Educational Publishing, Nutmeg Media, Options Publishing, Perfection Learning, Scholastic, Scott Foresman, Silver Burdett and Ginn, Simon & Schuster, Steck-Vaughn, Troll Medallion, Turtle Books, Turtleback Books, The Rowland Reading Foundation, Time Life Books for Children, Voyager, and William H Sadlier Inc.